You can click on your character in the game to customize the colors. The possible customizations are gender, hair color, eye color, shirt color, and skin color. I know, this isn't much to customize, but this isn't an avatar customizing game, we're trying to help chickens here!" Cripes, so we can choose our eye, shirt and skin coloUr, but remember kids, we're doing this to help Chickens! Imagine all the Chickens in the world, desperate to have the suffix "Friend" bolted on the back of their name, instead, we're playing Facebook Games, and "helping" virtual Chickens, made of pixels! "You can have a tremendous impact on the lives of countless animals simply by removing eggs from your shopping list. There are many cruelty-free ingredients that can be used to replace eggs in virtually any recipe. Egg production is one of the cruelest animal agriculture industries. Hens have their beaks mutilated, are intensively confined for their entire lives, and the male chicks of egg-laying breeds are ground up alive or suffocated at birth. Please pledge now to help hens! " "220 people have pledged to stop purchasing eggs for good. 84 people have pledged to reduce the number of eggs they buy, and only buy cage free or free range." ..... why would they even have an option for anything other than "not treating animals as objects, as little factories that we own", as if they are buildings, and we the land owner? Who knows what the real numbers for those who'll "stop purchasing eggs for good" will be from such a pledge, how many Vegans flocked (ha!) to the site through word of mouth etc? Great advice is offered, from no less than The King of Animal Rights, Bernie Rollin! "As Dr. Bernard Rollin with the Department of Animal Science at Colorado State University stated, "The most obvious problem is lack of exercise and natural movement. Under free- range conditions, hens walk a great deal. Wing flapping, which is common in free-range animals, is also prevented in cages. Comfort behavior is likewise truncated, as is leg stretching and preening. Research has confirmed what common sense already knew—animals built to move must move." His Wikipedia page mentions: "In his spare time, he is a weight-lifter, horseman, and motorcyclist. ", good to know! The "Farm Rescue" site seems to be run by HSUS, judging by the links to HSUS websites. Corrected: The website was made by Mark Middleton, of http://www.animalvisuals.org/ , thanks Elaine! "One of the best ways we can help improve animal welfare is by simply eating fewer animal products and instead choosing from a wide variety of meat and egg-free foods that are satisfying, delicious, and easy to find or prepare." Um.....we help Animal Welfare by eating less animals, by not eating animals? That sounds more like Animal Rights....how is the Welfare of nonexistant animals "help improved" when we avoid treating animals as things? "Tell McDonalds to go Cage Free!" Fast food chains like Wendy's, Arby's, Burger King, Subway, and Quizno's, have started to phase out the use of eggs from hens confined in battery cages. Please urge McDonald's to follow their lead. McDonald's lags far behind the rest of the industry and continues to use eggs exclusively from hens confined in cages for their entire lives. Please call or e-mail them and ask them to switch to cage-free eggs." But the best one...."join the meatless monday movement" (good grief....now its a "movement"? People are fighting and dying for meatless monday? The Man is cracking down on Meatless Monday freedom fighters? "Join the Meatless Monday Movement! Join the Meatless Monday movement. You don't have to be a vegan to discover great vegetarian food one day a week! Meatlessmonday.com has tons of recipes and resources to help you join the global movement to cut meat consumption by 15%, and to help you get the program going in your school, restaurant, or cafeteria. This is a movement that's catching on everywhere food is served! Chickens are wonderful, the *least* we can do for them, for ALL animals, human and not is to avoid harming them! 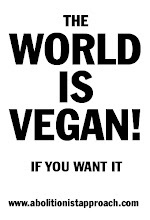 Instead of using a million different terms, "egg free", "veg", "cage free", "vegetarian"... lets be *VEGAN*!